Postoperative pulmonary complications (PPC) may result in longer duration of in-hospital stay and even mortality. Both thoracic surgery and intraoperative mechanical ventilation settings add considerably to the risk of PPC. 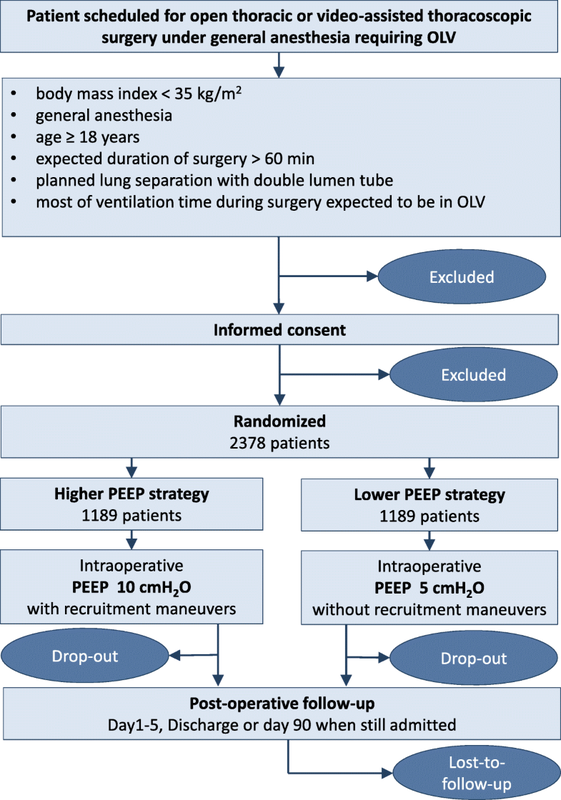 It is unclear if one-lung ventilation (OLV) for thoracic surgery with a strategy of intraoperative high positive end-expiratory pressure (PEEP) and recruitment maneuvers (RM) reduces PPC, compared to low PEEP without RM. PROTHOR is an international, multicenter, randomized, controlled, assessor-blinded, two-arm trial initiated by investigators of the PROtective VEntilation NETwork. In total, 2378 patients will be randomly assigned to one of two different intraoperative mechanical ventilation strategies. Investigators screen patients aged 18 years or older, scheduled for open thoracic or video-assisted thoracoscopic surgery under general anesthesia requiring OLV, with a maximal body mass index of 35 kg/m2, and a planned duration of surgery of more than 60 min. Further, the expected duration of OLV shall be longer than two-lung ventilation, and lung separation is planned with a double lumen tube. Patients will be randomly assigned to PEEP of 10 cmH2O with lung RM, or PEEP of 5 cmH2O without RM. During two-lung ventilation tidal volume is set at 7 mL/kg predicted body weight and, during OLV, it will be decreased to 5 mL/kg. The occurrence of PPC will be recorded as a collapsed composite of single adverse pulmonary events and represents the primary endpoint. PROTHOR is the first randomized controlled trial in patients undergoing thoracic surgery with OLV that is adequately powered to compare the effects of intraoperative high PEEP with RM versus low PEEP without RM on PPC. The results of the PROTHOR trial will support anesthesiologists in their decision to set intraoperative PEEP during protective ventilation for OLV in thoracic surgery. The trial was registered in clinicaltrials.gov (NCT02963025) on 15 November 2016. T. Kiss and J. Wittenstein contributed equally to this work. The online version of this article ( https://doi.org/10.1186/s13063-019-3208-8) contains supplementary material, which is available to authorized users. Postoperative pulmonary complications (PPC) increase morbidity, resulting in longer duration of in-hospital stay and even increased mortality [1, 2, 3]. Several independent risk factors for the development of PPC have been identified , including patients’ health conditions, surgical approaches, and anesthetic management . In addition, thoracic surgery  and intraoperative mechanical ventilation settings  add considerably to the risk of PPC. Experimental [6, 7, 8] and clinical evidence [9, 10, 11] show that mechanical ventilation has the potential to aggravate or even initiate lung injury (so called ventilator-induced lung injury; VILI). Repetitive collapse/reopening of lung units (atelectrauma), overdistension of lung units (volutrauma), and increased airway pressures (barotrauma) are possible mechanisms underlying VILI [12, 13, 14]. While positive end-expiratory pressure (PEEP) can minimize atelectrauma and low tidal volumes (VT) reduce volutrauma, ventilation at low airway pressures may decrease barotrauma. A metanalysis showed that use of low VT is associated with favorable outcomes in patients without injured lungs . More recently, another meta-analysis showed a decrease in the incidence of lung injury, pulmonary infection, and atelectasis in patients receiving intraoperative mechanical ventilation with low VT and PEEP . In patients undergoing abdominal surgery, an intraoperative ventilation strategy with low VT and PEEP improved postoperative lung function  and even outcome . In contrast, when low VT is used, the use of high PEEP combined with recruitment maneuvers (RM), as compared to low PEEP without RM, does not add to protection against PPC . To our knowledge, the potential of high PEEP and RM during one-lung ventilation (OLV) for thoracic surgery to reduce PPC has not been investigated in adequately powered trials [19, 20]. Due to mediastinal displacement, surgical manipulation, and chest immobilization, pressures in the dependent lung  and atelectasis formation are higher during thoracic surgery as compared with the other types of surgeries . Thus, OLV might benefit from mechanical ventilation with high PEEP and RM. In view of these facts, we designed the PROtective ventilation with high versus low PEEP during OLV for THORacic surgery (PROTHOR) trial. We hypothesized that intraoperative mechanical ventilation using high PEEP with periodic RM, as compared to low PEEP without RM, will prevent PPC in patients undergoing thoracic surgery with OLV. PROTHOR is an international, multicenter, randomized, controlled, assessor-blinded, two-arm trial initiated by investigators of the PROtective VEntilation NETwork (http://provenet.eu). In total, 2378 patients will be randomly assigned to one of two different intraoperative mechanical ventilation strategies (see CONSORT diagram, Fig. 1). The PROTHOR trial tests the hypothesis that, in patients undergoing thoracic surgery under OLV, high levels of PEEP and RM, as compared with low levels of PEEP without RM, reduce PPC. Investigators screen patients aged 18 years or above scheduled for open thoracic or video-assisted thoracoscopic surgery under general anesthesia requiring OLV, with a maximal body mass index of 35 kg/m2, and a planned duration of surgery of more than 60 min. Further, the expected duration of OLV shall be longer than two-lung ventilation (TLV), and lung separation is planned with a double lumen tube. The number of patients meeting these enrollment criteria will be recorded by means of a screening log file. Patients are excluded if they have documented chronic obstructive pulmonary disease (COPD) GOLD grades III and IV, lung fibrosis, documented bullae, severe emphysema or pneumothorax; uncontrolled asthma; heart failure New York Heart Association grade 3 and 4 or coronary heart disease Canadian Cardiovascular Society grade 3 and 4; previous lung surgery; at-rest documented mean pulmonary arterial hypertension > 25 mmHg, or systolic pulmonary arterial pressure > 40 mmHg (as estimated by ultrasound); documented or suspected neuromuscular disease (e.g., thymoma, myasthenia, myopathies, muscular dystrophies); are planned for mechanical ventilation after surgery; are planned for bilateral procedures; undergo lung separation with a method other than double lumen tube; are operated in prone position; show persistent hemodynamic instability or intractable shock (as judged by the treating physician); have intracranial injury or tumor; are enrolled in other interventional studies or refuse informed consent; are pregnant (excluded by anamnesis and/or laboratory analysis); have documented preoperative hypercapnia > 45 mmHg (6 kPa, kPa); are planned for esophagectomy, pleural surgery only, sympathectomy surgery only, chest wall surgery only, mediastinal surgery only, and lung transplantation without surgical treatment of the lung tissue. Additionally, patients will be excluded if aspiration, moderate respiratory failure, infiltrates, pulmonary infection, atelectasis, cardiopulmonary edema, pleural effusion, pneumothorax, pulmonary embolism, purulent pleurisy, or lung hemorrhage are diagnosed before surgery. Mechanical ventilation is applied in volume-controlled mode. Following intubation, PEEP is set according to the randomization group, i.e., 5 cmH2O in the low PEEP level group and 10 cmH2O in the high PEEP level group. In both groups, the PEEP is maintained unchanged until extubation, unless rescue for hypoxemia mandates adjustments. If auto-PEEP is suspected, the respiratory rate or inspiratory to expiratory time (I:E) ratio may be changed at discretion of the treating physician. During TLV, VT is set at 7 mL/kg predicted body weight (PBW). The PBW is calculated according to a predefined formula, as follows: 50 + 0.91 x (height in cm – 152.4) for males and 45.5 + 0.91 x (height in cm – 152.4) for females . During OLV, VT will be decreased to 5 mL/kg PBW, while keeping other settings initially unchanged. 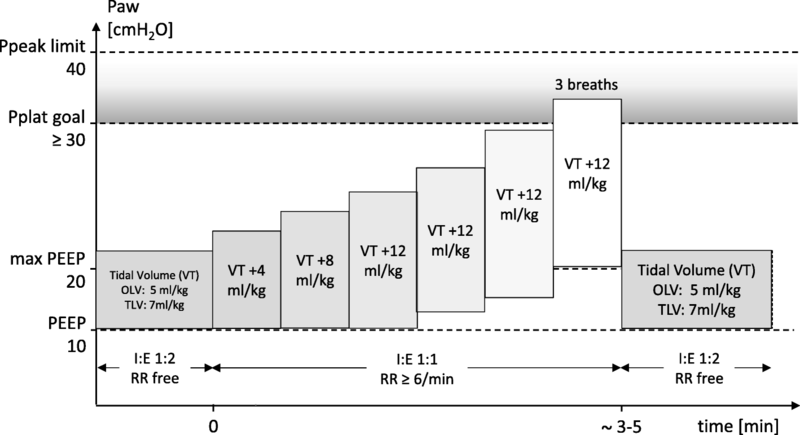 If peak pressure > 40 cmH2O, or plateau pressure > 30 cmH2O, the I:E ratio is first changed to 1:1. Thereafter, VT can be decreased to 4 mL/kg PBW. Further settings are fraction of inspiratory oxygen (FIO2) ≥ 0.4, I:E 1:1 to 1:2, and respiratory rate adjusted to normocapnia (partial arterial carbon dioxide pressure (PaCO2) between 35 and 45 mmHg). Standardized RM (Fig. 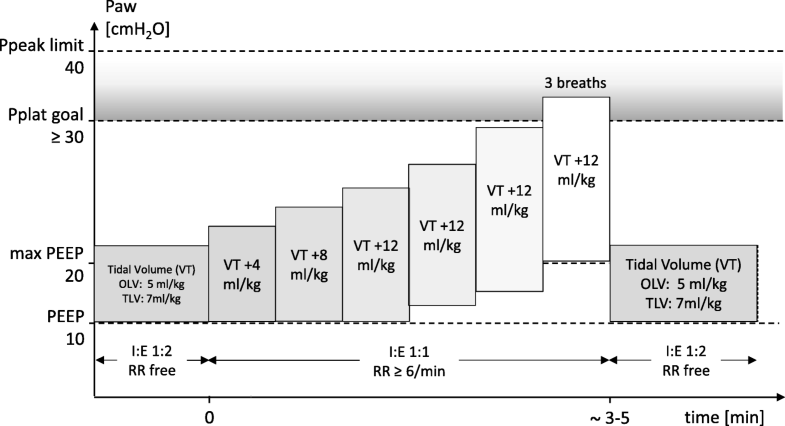 2) are performed with stepwise increase of VT in volume-controlled ventilation (Table 1). A lung re-expansion maneuver of the non-ventilated lung may be necessary in both groups due to different reasons, including detection of air leaks by request of surgeons, as part of a rescue strategy due to hypoxemia, or before switching from OLV to TLV to re-expand the collapsed lung. Such a maneuver is performed in a hemodynamically stable patient (as judged by the anesthesiologist) and in agreement with the surgeon. To obtain standardization among centers, re-expansion maneuvers of non-ventilated lungs are performed with continuous positive airway pressure (Table 1). If hypoxemia, defined as peripheral oxygen saturation (SpO2) < 90% for longer than 1 min occurs, rescue should be performed (Table 2). If hypercapnia (PaCO2 > 60 mmHg) with respiratory acidosis (pHa < 7.20) occurs during OLV, different steps are applied in the high and low PEEP groups (Table 2). In addition, the study protocol stresses that routine intraoperative monitoring should include measurements of blood pressure, pulse oximetry, end-tidal carbon dioxide fraction, and electrocardiography. Every patient should receive at least one peripheral venous line to allow adequate fluid resuscitation during the study period. 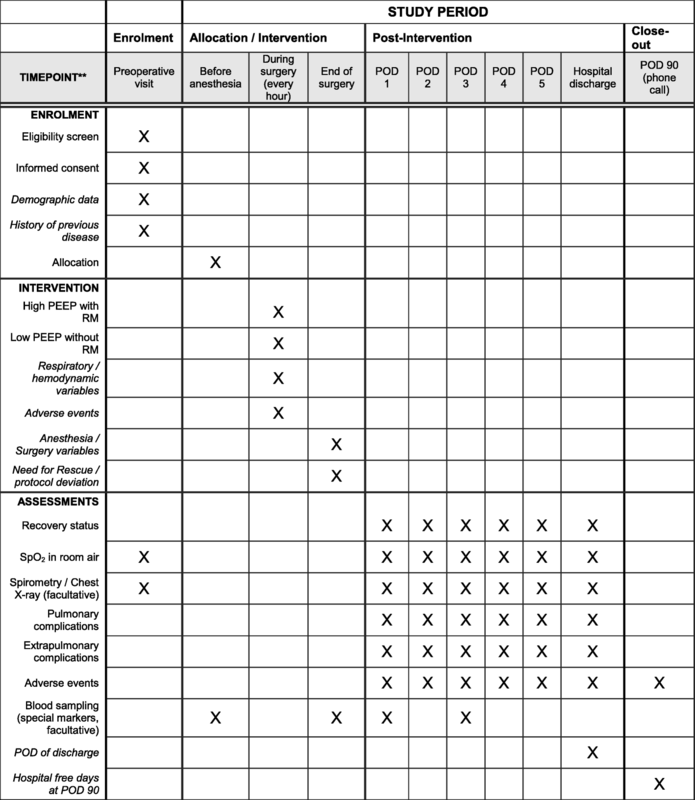 Other procedures should follow the Safe Surgery Checklist of the World Health Organization as published (www.who.int/patientsafety/safesurgery/en/index.html). Allocation sequence is computer generated (nQuery Version 4.0) using permuted blocks with random sizes of 4, 6, and 8. Allocation is stratified per center with an allocation ratio of 1:1 for each group. The process of sequence generation and storage is managed by an independent database manager not involved in patient care. Randomization is then performed patient-by-patient using a web interface (REDcap™). At each study site, at least two assessors are involved with the study. One assessor is involved with the intraoperative mechanical ventilation strategy and performs randomization as well as the interventions defined in the protocol. A second assessor, who is blinded to randomization, performs postoperative visits and assessment of primary and secondary endpoints. The primary endpoint is a collapsed composite of all PPC developing within the first 5 postoperative days. With this approach each complication has an equal weight. Patients who develop a least one complication are considered as meeting the primary endpoint. At the discretion of participating centers, blood and urine samples are collected preoperatively as well as directly postoperative and on the postoperative days 1–5. Samples will be analyzed centrally for systemic markers of inflammation and coagulation (including but not limited to interleukins 6 and 8, thrombin-antithrombin, protein C, and plasminogen activator inhibitor-1) as well as systemic markers of injury to the lungs (including but not limited to plasma E-cadherin, soluble receptor for advanced glycation end-products, surfactant proteins A and D, and distal organs, including renal injury (including but not limited to plasma/urine neutrophil gelatinase-associated lipocalin, and cystatin C). The standard operating procedure for collecting and processing plasma and urine is available in Additional file 1. Patients are visited preoperatively, intraoperatively, daily between postoperative days 1 and 5, and on discharge. On postoperative day 90, patients are contacted by phone (Fig. 3). Patients are screened according to inclusion criteria. All patients meeting the inclusion criteria are registered in a screening log file by each center. Eligible patients meeting none of the exclusion criteria are asked by the physician for written informed consent (the consent form and information to study patients form are available in Additional file 1). Baseline variables are collected, including gender, age, height, weight, ARISCAT Score, physical status according to the American Society of Anesthesiologists, functional status according to cumulated ambulation score, metabolic equivalents, cardiovascular status (heart failure according to the New York Heart Association, coronary heart disease according to Canadian Cardiovascular Society, atrial flutter/fibrillation, arterial hypertension), pulmonary status (chronic obstructive pulmonary disease, including steroids and/or inhalation therapy use, respiratory infection within the last month, use of non-invasive ventilatory support), history of obstructive sleep apnea (including Apnea and Hypopnea index or STOP-Bang score in patients without diagnosis of obstructive sleep apnea), metabolic status (diabetes mellitus, including data on treatment), history of active cancer, smoking status, alcohol status, gastroesophageal reflux, oral medication (e.g., use of antibiotics, statins, aspirin), preoperative organ function (SpO2 in supine position, upper body elevated 30–45 degrees breathing room air; if possible, respiratory rate, heart rate, mean arterial pressure, body temperature, airway secretion, including data on purulence, visual analogue scales (1–10) for dyspnea, thoracic rest pain and coughing pain). Preoperative non-mandatory measurements include spirometry (arterial partial pressure of oxygen, carbon dioxide and pH value, forced vital capacity (FVC), forced expiratory volume in one second (FEV1), Tiffeneau value (FEV1/FVC), total lung capacity, diffusing capacity for carbon monoxide, and maximal oxygen consumption), predicted postoperative respiratory function (predicted postoperative FVC, FEV1, and diffusing capacity for carbon monoxide), chest x-ray (assessed for infiltrates, pleural effusion, atelectasis, pneumothorax, and cardiopulmonary edema) as well as routine laboratory tests (including hemoglobin, hematocrit, WBC count, platelet count, INR, partial thromboplastin time, creatinine, blood urea nitrogen, alanine amino transferase, aspartate amino transferase, bilirubin, c-reactive protein, and procalcitonin). During the intraoperative visit, both surgery- as well as anesthesia-related data are recorded, including duration of anesthesia (from intubation to extubation or exit of operating room if on mechanical ventilation), duration of OLV and TLV, duration of surgery (from incision to closure), total blood loss, total urine output, side of OLV and side of surgery, method of lung separation (double lumen tube, endobronchial blocker, double lumen tube with embedded camera), way of placement confirmation (fiberoptic bronchoscopy, embedded camera), administration of antibiotics, use of regional anesthesia (epidural, paravertebral, other), use of non-invasive ventilation during induction, patient position during induction, patient temperature at the end of surgery, monitoring of neuromuscular function during anesthesia, use of neuromuscular blocker antagonists, priority and type of surgery, wound classification, type of surgical resection, patient position during surgery, estimated amount of lung resection, and drugs and fluids administered during anesthesia (e.g., anesthetics, vasoactive drugs, transfusion). Ventilator settings, hemodynamics, need for rescue strategy, and adverse events (AEs) are recorded at anesthesia induction, with the patient in final surgical position and TLV, 10 min after OLV, hourly thereafter during OLV, and at the end of surgery with TLV in supine position. The routine measurements are documented first, then the gas probes are taken; thereafter, the RM is performed in the high PEEP group. RM are documented during the plateau phase of the RM in the high PEEP group after bronchoscopy or disconnection of the ventilated lung from the mechanical ventilator, after the beginning of OLV, every 1 hour during OLV, after re-expansion of the non-dependent lung and resumption of TLV, and at the end of surgery in supine position. Clinical data, including actual organ function and the presence of PPC, are scored during postoperative visits on a daily basis. Additionally, secondary endpoints, such as postoperative extrapulmonary complications, need for unexpected intensive care unit admission or readmission, and any type of postoperative respiratory intervention, are recorded. On day 1 after surgery, fluid and transfusion data are recorded in a detailed manner. Furthermore, the use of physiotherapy, breathing exercises, antibiotics as well as the cumulated ambulation score, status of wound healing, postoperative nausea, and vomiting are assessed. Non-mandatory measures include chest x-ray, spirometry, and routine laboratory tests. Patients will be visited until discharge. The number of hospital-free days at day 28 (including readmission since hospital discharge) and 90-day survival are calculated. Day 90 is defined as the last day of follow-up; accordingly, patients still admitted to hospital will be last visited on that day. Participation in the trial is voluntary. Patients have the right to withdraw consent to the study at any time for any reason without any consequence for further medical treatment. The reasons and circumstances for study discontinuation will be documented in the case report form (CRF). Primarily, all data will be analyzed according to the intention-to-treat principle. Secondarily, data will be analyzed per-protocol. The objective of the clinical data management plan is to provide high-quality data by adopting standardized procedures to minimize the number of errors and missing data and, consequently, to generate an accurate database for analysis. Two members of the research team perform study monitoring. Remote monitoring is performed to signal early aberrant patterns, issues with consistency, credibility, and other anomalies. On-site assessment of protocol adherence and completeness of the research dossier will be conducted in up to 10 sites including the highest number of patients, and also neighbor sites to them. Patient data are collected in pseudonymous form using a patient (identification) number composed of six digits, the first three of which correspond to the site ID and the remaining digits correspond to the patient inclusion number at the respective site. Study data are collected and managed using REDCap™ electronic data capture tools hosted at the Clinical Trial Coordination Center (KKS) of the University of Dresden, Germany. REDCap™ (Research Electronic Data Capture) is a Secure Sockets Layer encrypted, password-protected, web-based application designed to support data capture for research studies . Full access to the final trial dataset will be granted to selected investigators only. If a sub-study is approved by the steering committee, access only to data related to the sub-study will be granted to the respective principal investigator. 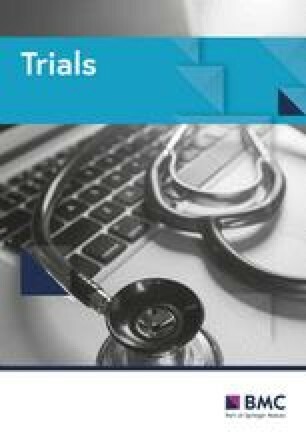 For this trial, we have planned to use an adaptive trial design, which accumulates data and uses external information to modify aspects of the design without undermining the validity and integrity of the trial. The group sequential methods design gives us the possibility for early stopping of the study if the experimental treatment shows a statistically significant therapeutic advantage at an interim assessment, but also allows early stopping for futility if the interim analysis reveals that, with high probability, the trial will be negative (Fig. 4). Sample size calculation was based on our primary study endpoint, taking data collected from a subset of patients undergoing OLV for thoracic surgery in a prospective observational, multicenter, international study (LAS VEGAS)  into account. LAS VEGAS showed an incidence of approximately 23% for a PPC composite comparable to the present definition. Assuming a significance level of 0.05 and a power of 90% to detect the expected difference in postoperative pulmonary complications between the high PEEP group of 17.25% and the low PEEP group of 23% (risk ratio of 0.75), a sample size of 2259 has been calculated. Assuming a dropout rate of 5%, a total of 2378 patients have to be included in the study. We used the software package East® for sample size calculations (East®, Version 6.3.1, Cytel Inc., USA). The Difference of Proportions test has been used to compare the independent samples from two populations (Group Sequential Design for a Binomial Superiority Trial, discrete endpoint two sample test, parallel design, difference of proportions, using the unpooled estimate of variance). The sample size calculation was done with the following parameters: Superiority Design, two-sided test; alpha 0.05; Power 0.9, allocation ratio 1; Proportion1 = 0.23; Proportion2 = 0.1725; Difference in Proportions = − 0.058. 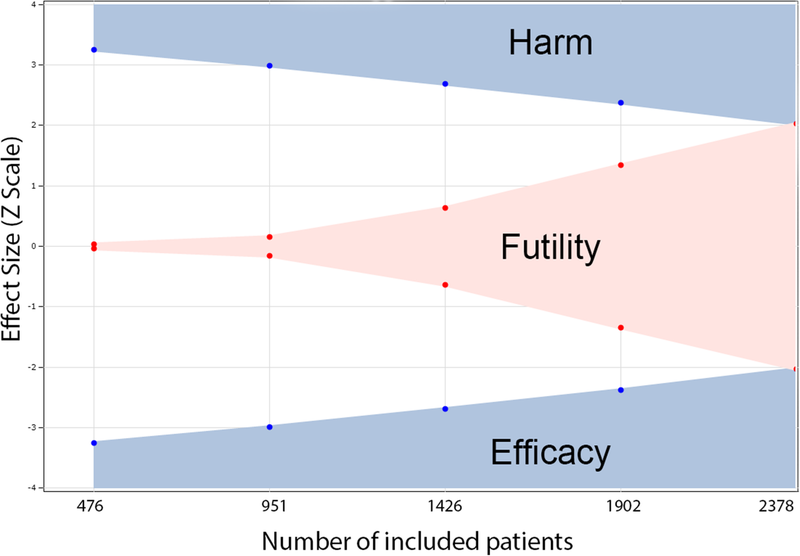 We used an alpha-spending function to generate efficacy boundaries and a beta-spending function to generate futility boundaries (Fig. 4; gamma family spending function, type I error 0.05, type II error 0.1). By using a gamma of − 4 for the alpha and gamma of − 2 for the beta spending function we have a moderate hurdle for early stopping for efficacy and a reasonable chance to stop early due to futility (Table 3). We constructed a non-binding futility boundary in such a way that it can be overruled if desired without inflating the type 1 error. This flexibility is important, since the data monitoring committee might well prefer to keep the trial going to gather additional information, despite crossing the futility boundary. We planned to take five interim assessments at the data for evidence of efficacy, harm, and/or futility with the aim of possibly stopping the trial early. The planned number of assessments describes the number of time points, including the closing date of the study, at which the investigator plans to analyze the thus far collected data. The spacing of assessments will be equal. Therefore, interim analyses will be performed after 20% (476 patients), 40% (952 patients), 60% (1426 patients), 80% (1902 patients), and 100% of patients (2378 in total) included. Patients will be randomly assigned to one of the two groups using a website-based data entry and randomization platform (REDcap™, Ver 6.6.2 Vanderbilt University, Tennessee, USA). Randomization will be conducted using blocks of 4, 6, and 8 patients, in aleatory fashion. Thereby, group sizes will be comparable at interim analyses, which will be conducted in a group-blinded manner. Continuous distribution of the data will be assessed by visual inspection of histograms and D’Agostino–Pearson’s normality tests. For both arms, the baseline characteristics will be expressed as counts and percentages, means and standard deviations, or medians and interquartile ranges whenever appropriate. Ventilatory parameters and vital signs over the surgery will be analyzed using a mixed-effect model with repeated measures and with patients and centers as a random-effect. No or minimal losses to follow-up for the primary and secondary outcomes are anticipated. Complete-case analysis will be carried out for all the outcomes. However, if more than 1% of missing data were found for the primary outcome, a sensitivity analysis using multiple imputations and estimating equation methods will be carried out. Hypothesis tests will be two-sided with a significance level of 5% with exception of the primary outcome, due to the correction for the interim analyses. We will not adjust p values for multiple comparisons. Analyses will be performed using the R (R Core Team, 2016, Vienna, Austria) program. The effects of the intervention on incidence of PPC will be reported as numbers and percentages and estimated with risk ratios and 95% confidence intervals calculated with Wald’s likelihood ratio approximation test and with χ2 tests for hypothesis testing. For the analysis of the primary outcome, the result will be considered significant if the p value is less than 0.0428 (correspondent to the Z-value of 2.025 for efficacy or futility in the final analysis in Table 3). Kaplan–Meier curves will be used to report time to PPC. Curves will be compared with the log-rank tests, and hazard ratios with 95% confidence intervals will be calculated with Cox proportional hazard models without adjustment for covariates. The proportional hazard assumptions will be tested using scaled Schoenfeld residuals and alternative parametric survival models will be used if the proportionality assumption is not sustained. The effect of the intervention on secondary binary outcomes will be assessed with risk ratio and 95% confidence intervals calculated with Wald’s likelihood ratio approximation test and with χ2 tests for hypothesis testing. The effects of the intervention on hospital-free days at day 28 will be estimated with a Student t test and reported as the mean difference between the two groups. The consistency of the findings of the Student t-test for the hospital-free days at day 28 will be confirmed according to the mean ratio calculated by a generalized additive model considering a zero-inflated beta distribution. Finally, 90-day mortality will be assessed using Kaplan–Meier curves, and hazard ratios with 95% confidence intervals will be calculated with Cox proportional hazard models without adjustment for covariates. The proportional hazard assumptions will be tested using scaled Schoenfeld residuals and alternative parametric survival models will be used if the proportionality assumption is not sustained. Treatment effects on incidence of PPC will be analyzed according to the following subgroups: (1) non-thoracoscopic versus thoracoscopic; (2) lateral decubitus versus supine position; (3) baseline SpO2 < 96% versus SpO2 ≥ 96%; and (4) COPD versus non-COPD. The effects on subgroups will be evaluated according to the interaction effects between each subgroup and the study arms by generalized linear models and presented in a forest plot. Per-protocol analyses: The per-protocol population will consist of patients truly ventilated with the pre-specified protocol. Thus, patients will be excluded from this population if receiving PEEP < 10 cmH2O in the high PEEP group or PEEP > 5 cmH2O and FIO2 < 1.0 in the low PEEP group, in any measurement during the surgery. The database will be locked as soon as all data are entered and all discrepant or missing data are resolved – or if all efforts are employed and we consider that the remaining issues cannot be fixed. In this step, the data will be reviewed before database locking. After that, the study database will be locked and exported for statistical analysis. At this stage, permission for access to the database will be removed for all investigators, and the database will be archived. No or minimal losses to follow-up for the primary and secondary outcomes are anticipated. Complete-case analysis will be carried out for all the outcomes, that is, excluding patients with missing data in the outcome of interest. However, if more than 1% of missing data were found for the primary outcome, a sensitivity analysis using multiple imputations and estimating equation methods will be performed. Participating centers are allowed to conduct sub-studies provided that (1) no interference with the primary protocol occurs; (2) approval by the local institutional review board is obtained; and (3) the steering committee accepts the proposal according to its originality, feasibility, and importance. Publication of sub-studies, in any form, is strictly forbidden until the results of the primary study have been published. The trial is managed by a team consisting of the chief investigator (Mert Sentürk), the trial coordinator (Thomas Kiss), the statisticians (A. Serpa Neto, K. Schubert and M. Kuhn), the informatics technician responsible for the web-based electronic data capture system (Marko Kaeppler), and independent monitors. A steering committee contributed to the design and revision of the study, and will be responsible for interpretation of data and compilation of a resulting manuscript. Patient data and safety is closely monitored by a data safety and monitoring board (DSMB) that consists of a chairperson (Daniel Sessler) and four further members (Arthur Slutsky, Andreas Hoeft, Jean-Louis Vincent, Jennifer Hunter). All AEs entered into the electronic CRF within pre-specified time frames, including severe AEs and suspected unexpected severe adverse reactions, are monitored by an international AE manager (Ary Serpa Neto), who provides the DSMB with reports for review. The DSMB further monitors the overall status of the trial, e.g., progress of patient enrollment, general adherence to protocol, and completeness of data entry. Monitoring visits will be conducted as deemed necessary by the DSMB. National coordinators are responsible for administration and communication with local principal investigators, as well as assistance during trial management and data collection. When submitting the report on the results of the trial for possible publication, sites will be eligible to one collaborative co-authorship plus a further co-authorship for every 20 treated patients with complete datasets. The PROTHOR trial was designed to determine whether a high level of PEEP with RM, as compared to low PEEP without RM, during OLV for thoracic surgery, prevents PPC. We opted for testing the impact of two ventilation strategies at the same low VT in order to focus on the independent effects of different airway pressures, especially PEEP. The decision to use a PEEP value of 5 cmH2O in the low PEEP group has been derived from a recent study on the practice of intraoperative mechanical ventilation and consensus agreement of the steering committee . In order to allow generalizability of results and to impact on clinical practice, we opted for a pragmatic study, where a fixed level of high PEEP is used. The decision of using a PEEP of 10 cmH2O in the high PEEP group was based on the fact that this value, on average, resulted in maximal dynamic compliance of the respiratory system during OLV in a recent study, and was accompanied by minor variability only . Additionally, this value is only 2 cmH2O higher than needed to effectively increase oxygenation and decrease physiological dead space [21, 28], while avoiding substantial hemodynamic impairment. Even a PEEP titrated to a respiratory mechanics target, for example, the compliance of the respiratory system , represents a compromise in terms of regional overdistension and collapse-reopening of lung units. Depending on regional differences, even this optimal PEEP will not completely prevent atelectasis formation . Thus, even an individualized PEEP titration in the high PEEP group would also result in a compromise between atelectrauma and volutrauma or barotrauma, and likely not differ importantly from the value selected a priori in the present trial. The RM is based on a stepwise increase of VT and PEEP. This maneuver allows opening of lung units without interruption of mechanical ventilation and ensures standardization across different centers. Since it uses volume-controlled ventilation, virtually all anesthesia ventilators can perform this maneuver. The target airway pressure range for recruitment was based on the fact that a level of 30 cmH2O was proposed in a recent study , and that airway pressure exceeding 40 cmH2O does not importantly contribute to open lungs even in mild acute respiratory distress syndrome . We decided for a combination of RM and PEEP in the high PEEP group. PEEP per se may not be enough to open atelectatic lung units. A CT study showed that, in patients at higher risk for development of intraoperative atelectasis, the combination of high PEEP and RM was able to revert lung collapse, whereas isolated high PEEP or RM did not achieve the same effect . Furthermore, during OLV, RM followed by PEEP has been shown to be associated with a more homogenous distribution of ventilation . The inspiratory time of approximately 5 s was chosen to allow enough pressure versus time product (over at least three consecutive cycles) to open atelectatic lung units. We opted for recruiting lungs not only after intubation, but also every hour thereafter, in order to revert possible progressive de-recruitment at PEEP of 10 cmH2O. For both the lower and higher PEEP groups, rescue protocols for the progression of intraoperative hypoxemia were defined in order to protect patients while allowing a standardized approach that minimizes the interference with the respective interventions. Importantly, deviations of the protocol, even rescue due to hypoxemia, are explicitly allowed, provided this in the best interest of patients. It is worth noting that recommendations have been made also with regard to different phases and aspects of the anesthetic procedure, including monitoring, choice of anesthetics agents, muscle paralysis and its reversal, intravascular volume loading and maintenance, and postoperative analgesia. However, PROTHOR is a pragmatic study and influence on local practice of respective sites is kept at a minimum, focusing on factors that are more directly related with the hypothesis investigated. Besides postoperative respiratory failure, several other adverse pulmonary events seem to add to the odds of mortality in the surgical population. In-hospital length of stay and mortality increase with the number of single pulmonary AEs in the postoperative period . Therefore, in the PROTHOR trial we opted for a binary collapsed composite of single adverse pulmonary events as primary endpoint, despite the fact that single events may differ in terms of severity. Thus, the use of PPC as primary endpoint in the PROTHOR trial not only has clinical relevance for the practicing anesthetist, but increases the study power due to summation of incidences of single AEs. In spite of this, the study analysis will address not only the composite itself, but also the incidence of each element separately. Not only the respiratory but also other organ systems may be impaired in the postoperative period in thoracic surgery patients. Thus, the analysis will also address the impact of intraoperative mechanical ventilation on single organs and a collapsed composite of non-pulmonary AEs, namely postoperative extrapulmonary complications. In addition, further relevant outcome measures that might be related to PPC and postoperative extrapulmonary complications, especially the hospital-free days at day 28, will be addressed. This outcome variable is not only a measure of morbidity, but also has direct impact on related health costs. Since we anticipate that, during surgery, both the lower and the higher PEEP groups will impact on intraoperative oxygenation, respiratory system mechanics, and arterial blood pressure, intraoperative respiratory function and hemodynamic variables will also be evaluated. Much attention has been paid to safety in the PROTHOR trial. Accordingly, data and patient safety during the PROTHOR trial is closely monitored by a DSMB. Additionally, an AE manager has been designated. A web-based electronic data capture system (REDCap™) is used for building the database within a secure system, while allowing access to the eCRF and randomization of patients into groups. We included complications that may be not directly related to VILI, more specifically pulmonary embolism and lung hemorrhage. However, the mechanical ventilation setting has been identified as an independent risk factor for venous thromboembolism . Both mechanical ventilation and PEEP tend to decrease right and left ventricular preload, especially in the presence of hypovolemia and may increase venous thromboembolism risk by exacerbation of venous stasis. Recruitment maneuvers but also redistribution of lung perfusion during OLV and TLV may facilitate lung hemorrhage, which has been defined as bleeding through the chest tubes requiring reoperation or transfusion. In summary, PROTHOR is the first randomized controlled trial in patients undergoing thoracic surgery that is adequately powered to compare the effects of intraoperative high PEEP with RM versus low PEEP without RM during OLV on PPC. The results of the PROTHOR trial will support anesthesiologists in their decision to set intraoperative PEEP during OLV with low VT for thoracic surgery. The PROTHOR trial is currently recruiting patients. Recruitment started January 2017. Estimated completion date 2021. We thank Marko Kaeppler for building and maintenance of the electronic CRF. We are indebted to all PROTHOR investigators listed in the Appendix. Funded in the United Kingdom by the AAGBI/NIAA (Association of Anaesthesists of Great Britain and Ireland/National Institute of Academic Anaesthesia). Additionally, each participating center accounts for the participants individual costs (institutional funding). The coordination center is supported by funding from the Department of Anesthesiology and Intensive Care Medicine, University Hospital Carl Gustav Carus, Technische Universität Dresden, Germany. TK conceived and designed the study, coordinates the overall study, and drafted the manuscript. JW, CB, and KB participated in the design of the study, act as local investigators in Dresden, and contributed to the final manuscript. GC participated in the design of the study and contributed to the final manuscript. EC participated in the design of the study, coordinates the study in the United States of America, and contributed to the final manuscript. MRET participated in the design of the study and contributed to the final manuscript. LFF participated in the design of the study, coordinates the study in Brazil, and contributed to the final manuscript. CG participated in the design of the study and contributed to the final manuscript. MG participated in the design of the study, coordinates the study in Spain, and contributed to the final manuscript. MGdA conceived and designed the study and drafted the manuscript, coordinates the study in Germany. TH participated in the design of the study and contributed to the final manuscript. MH participated in the design of the study, coordinates the study in the Netherlands, and contributed to the final manuscript. RJ participated in the design of the study, coordinates the study in Serbia, and contributed to the final manuscript. WK participated in the design of the study and contributed to the final manuscript. JK participated in the design of the study and contributed to the final manuscript. TL participated in the design of the study, coordinates the study in Germany, and contributed to the final manuscript. MJL participated in the design of the study, coordinates the study in Switzerland, and contributed to the final manuscript. NM participated in the design of the study and contributed to the final manuscript. GHM participated in the design of the study, coordinates the study in the United Kingdom, contributed to the final manuscript, and obtained funding to allow Portfolio inclusion by the NIHR in the United Kingdom. MTM participated in the design of the study, coordinates the study in the United States of America, and contributed to the final manuscript. VN participated in the design of the study and coordinates the study in Serbia. ZNS participated in the design of the study and contributed to the final manuscript. VN participated in the design of the study and coordinates the study in Serbia. PP conceived and designed the study, drafted the manuscript, and coordinates the study in Italy. RR participated in the design of the study and contributed to the final manuscript. MS conceived and designed the study and drafted the manuscript. ASN performed the sample size calculation, drafted the statistical analysis plan, and contributed to the final manuscript. PS participated in the design of the study and contributed to the final manuscript. LS participated in the design of the study, coordinates the study in Belgium, and contributed to the final manuscript. TV participated in the design of the study, coordinates the study in Hungary, and contributed to the final manuscript. GV participated in the design of the study, coordinates the study in Greece, and contributed to the final manuscript. JZ participated in the design of the study and contributed to the final manuscript. MS conceived and designed the study and drafted the manuscript. All authors read and approved the final manuscript. The Istanbul University, Medical Faculty, Ethical Committee of clinical research approved the study on 08.04.2016 (File number 2016/483, study protocol version 1.9). Additionally, the institutional review board at the University Hospital Dresden, Technische Universität Dresden, Dresden, Germany, approved the study on 23.09.2016 (reference no. EK 392092016, study protocol version 1.9). The respective review boards of participating sites also approved the study. PROTHOR is designed in accordance to the principles of the Declaration of Helsinki. Written informed consent was obtained from every enrolled patient upon request by the local institutional review board. MRET received free airway device samples from Ambu in April 2014 and from Airtraq in March 2015 for use in another three published studies. He has no direct financial or other interests in Ambu or Airtraq (in the context of this and his studies). All other authors declare that they have no competing interests.